[ABOVE] The reverse of a carte-de-visite produced by Gustav Schulz's Anglo-German Studio at 44 Ship Street, Brighton. Gustav Schulz was the proprietor of the Anglo-German Studio between 1880 and 1882. [ABOVE] The trade plate of Gustav Schulz, Portrait Painter and Photographer of Brighton, taken from the reverse of a carte-de-visite produced at Schulz's Preston Street studio. Gustav Otto Schulz, artist and photographer, was born in Gornitz, Prussia (Germany) around 1849. Gustav Schulz was apparently a keen traveller and there is evidence that as a young man he had journeyed to South Africa and South America. By 1875, Schulz was living in England at the Sussex seaside resort of Brighton. Early in 1875, Gustav Schulz, who was then in his mid-twenties, married 18 year old Sarah Smith (born 10th September 1857, Brighton). During the first five years of their marriage, Gustav and Sarah Schulz produced three children - Gustav Joseph Ferdinand Schulz (born 1875, Brighton), who was baptised at St. Margaret's Church, Brighton on 4th July 1875, Emily Rosalie Anatolia Schulz (born 1877, Brighton), who was baptised at St. Margaret's Church, Brighton on 27th May 1877, and Friederich (Fritz) Alexander Schulz (born 1879, Brighton), who was baptised at St. Nicholas's Church, Brighton on 10th October 1879. At the time of the birth of his third child, Gustav Schulz, who described himself as an "Artist", was living at 41 West Hill Street, Brighton. [ G. O. Schulz is listed at 41 West Hill Street in Page's General Directory for Brighton published in 1878 and 1879 ]. Around 1880, Gustav Schulz established the Anglo-German Studio at 44 Ship Street, a photographic studio located "three doors" from Brighton's General Post Office. These premises were previously used as a studio by the Italian-born photographer George Cassinello (1831-1911), who in 1880, after working nearly twenty years at various locations in Brighton, sold his Ship Street studio to Schulz and moved on to Lewisham. Gustav Schulz was a topographic and portrait photographer, producing views of notable buildings in Brighton and Sussex, as well as studio portraits in the popular carte-de-visite format. Schulz's publicity mentions that he sold photographic views of ecclesiastical buildings from his premises in Ship Street, Schulz having the "finest collection of churches in Sussex". Gustav Schulz styled himself as a "Portrait Painter and Photographer". I have not located any conventionally painted portraits signed by Gustav Schulz and it appears that, like many other professional photographers in Brighton during this period, instead of inviting customers to pose for a painted portrait, Schulz would paint over enlarged photographic portraits taken at his studio. On the reverse of his small carte-de-visite portraits ( which measured roughly 21/2 inches by 41/4 inches or 6.3 cm by 10.5 cm), Schulz advised his customers that "this (photographic portrait) or any other portrait" could be "enlarged up to life size and painted in oil or water colors, to order." [ABOVE] Details of the family of Gustav Schulz taken from the 1881 Census of Brighton. Gustav's second son, Friederich often Anglicized his name to "Frederick", but he was affectionately known as "Fritz". On the 1881 census return, Gustav Schulz gave his occupation as "Artist", yet at the time of the census he was working as a commercial photographer, running the Anglo-German Studio at 44 Ship Street, Brighton. 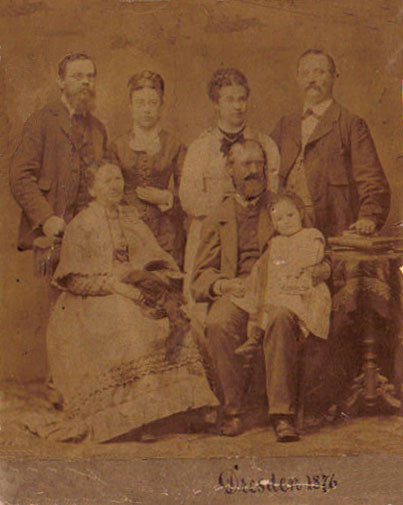 [ABOVE] A family group portrait of members of the Schulz family. Gustav Schulz, the German artist and photographer who settled in Brighton in 1875, stands on the left-hand side of the photograph with his wife Sarah. The couple on the right are believed to be Gustav Schulz's sister and her husband. Gustav Schulz's parents are seated at the front. Gustav and Sarah Schulz's first child, Gustav Joseph Ferdinand Schulz, is seated on his grandfather's lap. This photograph which is labelled "Dresden 1876", probably marks the occasion when Gustav Schulz took his new wife and child to meet his parents in Germany. This photograph was submitted by Pat Garner, a grand-daughter of Gustav Schulz junior, the child seated on his grandfather's knee. 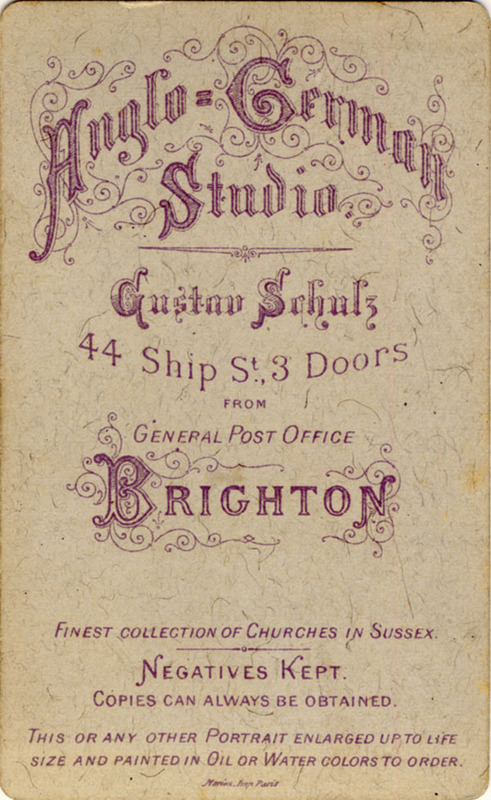 Around 1883, Gustav Schulz sold his Anglo-German Studio at 44 Ship Street and acquired new business premises at 14 Preston Street, Brighton. Preston Street ran down from the main shopping street of Western Road down to the King's Road on Brighton's seafront. Number 14 Preston Street had not been previously used as a photographic studio and at the time of the 1881 census it was a lodging house located between Henry Ingledew's New Pier Tavern at No. 13 and a milliners' shop run by two unmarried sisters, Jane and Maria Priday. 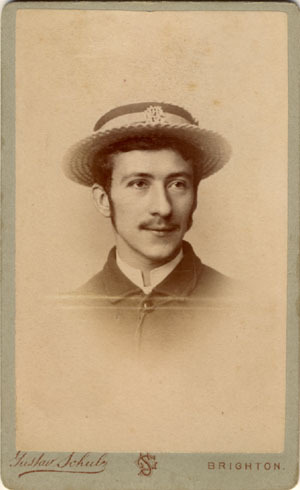 Gustav Schulz operated as a portrait photographer at 14 Preston Street, Brighton for the next five years. During this time there were three more additions to the Schulz family - Maude Louisa Schulz (born c1882, Brighton), Karl (Carl) Bruno Schulz, whose birth was registered in Brighton during the First Quarter of 1884 and Albert Stanley Schulz, who was born in Brighton three years later [birth registered in Brighton during the First Quarter of 1887]. 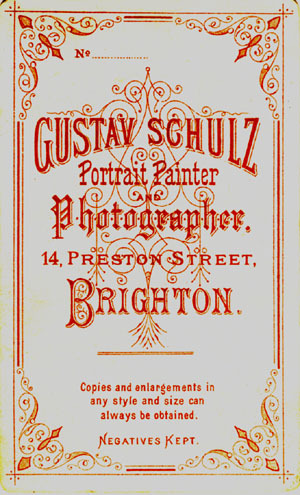 Gustav Schulz closed his photographic studio in Brighton around 1887. The building at No.14 Preston Street was not occupied by Schulz in 1888 and he was listed as a photographer at this address for the last time in the 1887 edition of Kelly's Directory of Sussex. According to David Tatham, a researcher into the history of the Falklands Islands, by this date Gustav Schulz had left England and was on a German steam ship heading for Port Stanley (see details below). It seems clear that Gustav Schulz was not working as photographer in Brighton between 1887 and 1890. In 1889, the business premises at 14 Preston Street was in the hands of a carver and gilder named Thomas Irwin. A Brighton Street Directory of 1888 (which would have been compiled during 1887) records a Mrs S. Schulz residing at 12 Upper Lewes Road, Brighton, but Gustav Schulz's name is not mentioned. Evidence suggests that Gustav Schulz was back in Brighton before the end of 1890. According to the birth registration, Gustav's youngest child, a boy named Ernest Kurt Schulz was born in Brighton during the Second Quarter of 1891. [ABOVE] A vignette portrait of a bearded man, photographed by Gustav Schulz at his studio in Preston Street, Brighton around 1882. (A full-length portrait of the same man is illustrated on the right). 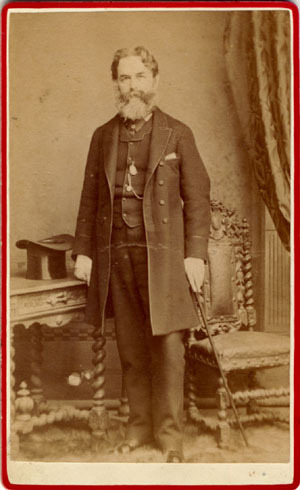 [ABOVE] A full-length portrait of a bearded man, a carte-de-visite portrait photographed by Gustav Schulz at his studio in Preston Street, Brighton around 1882. 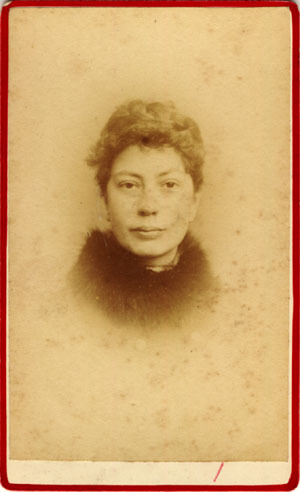 [ABOVE] A carte-de-visite portrait of a woman, photographed at Gustav Schulz's Anglo-German Studio,44 Ship Street, Brighton (c1881). [ABOVE] A carte-de-visite portrait of a woman, photographed by Gustav Schulz of 14 Preston Street, Brighton (c1882). 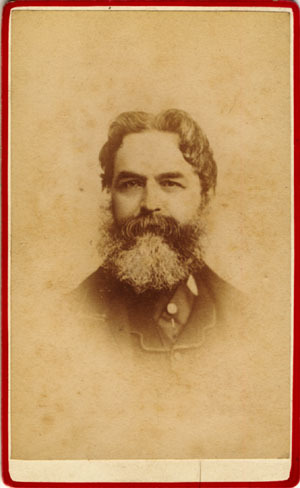 [ABOVE] A carte-de-visite portrait of a man, photographed by Gustav Schulz of 14 Preston Street, Brighton (c1885). [ABOVE] A carte-de-visite portrait of a girl, photographed by Gustav Schulz of 14 Preston Street, Brighton (c1882). [ABOVE] The reverse of a carte-de-visite produced by the Anglo-German Studio (Gustav Schulz) at 44 Ship Street, Brighton (c1881). [ABOVE] The reverse of a carte-de-visite produced by Gustav Schulz, Portrait Painter and Photographer, at 44 Ship Street, Brighton. [ABOVE] Details of the family of Gustav Schulz taken from the 1891 Census of Brighton. [ABOVE] Details of the family of Gustav Schulz taken from the 1901 Census of Brighton. Around 1887, Gustav Schulz began his long journey to South America and the Falkland Islands. 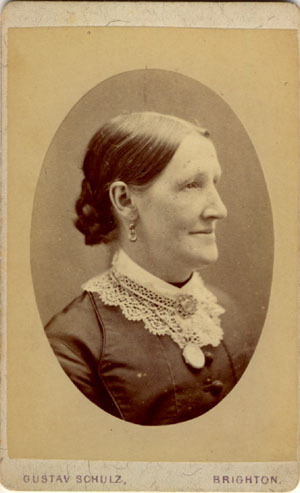 Mrs Sarah Schulz remained in Brighton with her children. The 1887 edition of Page's General Directory for Brighton & Hove does not list Gustav Schulz as a photographer in Brighton and the Street Directory section shows that 14 Preston Street was unoccupied by 1887. Local Street Directories record Mrs Sarah Schutz at 12 Upper Lewes Road, Brighton between 1888 and 1902. After 1903, the house at No. 12 was occupied by Mrs S. R. Cripps, an elderly widow. The 1891 census shows thirty-three year old Sarah Schulz at 12 Upper Lewes Road, Brighton with six of her seven children. The missing child was her eldest son Gustav Schulz junior, who would have been sixteen year old in 1891. Sarah Schulz is entered on the census return as the "Head of Household" and she gives her status as "Married". Sarah's husband, the forty-two year old artist Gustav Schulz, was working abroad on one of his photographic projects. In 1890, a published account of Schulz's travels around the Falkland Islands, together with twenty-one photogravures of his original photographs, was being prepared in Leipzig. 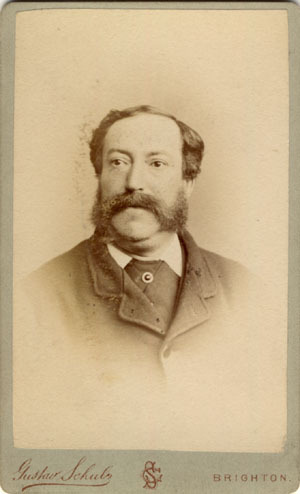 We also know that in the early 1890s, Gustav Schulz was commissioned by Friedrich August Fluckiger (1828-1894), a German professor of botany and pharmacology, to make a photographic record of perfume factories in Leipzig, Prague and New York and he was possibly engaged in this project at the time of the 1891 census. There is a possibility that the photographer's eldest son Gustav Schulz junior was abroad with his father, assisting him in his photographic work. When the 1901 census was taken, Gustav Schulz's wife and family were still living at 12 Upper Lewes Road, Brighton. As in 1891, Sarah Schulz is again listed as the "Head of Household". Her two eldest sons, Gustav Schulz junior and Fritz Schulz (whose first name was given as "Frederick" on the 1891 census return), were both living in Hammersmith in West London, and were both working as electrical engineers. Gustav Schulz junior had married Edith Mary Jackson (born 1872, Worthing, Sussex) in Brighton in 1897 and had started a family of his own. 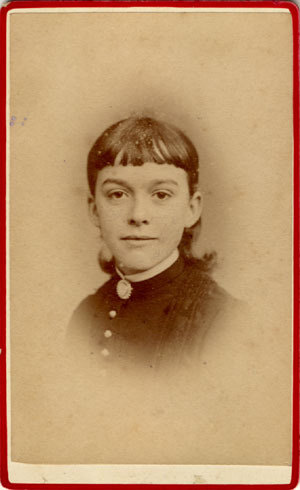 Mrs Schulz's eldest daughter, twenty-three year old Emily Schulz, was working as a telephone operator and seventeen year old Carl Bruno Schulz was employed as a clerk in a newspaper office. With her husband away and her two eldest boys living and working in London, Mrs Sarah Schulz rented out her son's room to two teenage brothers, Robert and James Skinner. Interestingly, one of these lodgers, sixteen year old Robert Skinner, was serving his apprenticeship as a photographer. Occasionally, Gustav Schulz would return to his home in Brighton. He was back in Brighton in the summer of 1890, when his youngest son Ernest Kurt Schulz was conceived. For most of the years between 1887 and 1902, Mrs Sarah Schulz is recorded as the head of the household at 12 Upper Lewes Road, but in 1895, and again in 1899, Kelly's Street Directory of Brighton recorded the name of Gustav Schulz at the family address. While he was in Germany, Gustav Schulz was approached by the eminent German botanist Friedrich August Fluckiger (1828-1894), who wanted the photographer to make a pictorial record of perfume manufacturing in Europe and the United States. Schulz was commissioned to take photographs of the perfume factories and production facilities owned by Schimmel & Co. in Leipzig and Prague and the perfume production plant in New York operated by Fritzsche Brothers, an American subsidiary of Schimmel & Co.
*The photogravure prints of Gustav Schulz's topographical and architectural photographs are keenly sought after by collectors. A collection of twenty photogravure prints on card measuring 27cm x 23cm from the 1890 edition of the Falkland Island series were valued from between �600 and �800 at a Christie's auction in 2005. A London edition of Gustav Shulz's Falklands Islands in its original gilt decorated, olive-green portfolio, containing a 24 page pamphlet and 20 photogravure illustrations, as printed by Julius Klinkhardt of Leipzig, recently went on sale for �750. A book expert who has examined the photogravures of Gustav Schulz's pictures of European and American perfume factories has described the photographic images as "wonderful" and having the "art quality of a lithograph", observing that "in one of the exterior views of a perfume factory, one is able to discern the tiniest little bricks in the building's facade, while simultaneously a depth is created due to the tone of the inks.. the effect is stunning." A leather bound copy of "The Factories of Schimmel & Co", containing over 30 photogravures depicting perfume factories in Leipzig, Prague and New York City was recently valued at $2000. Copies of Schulz's photographic images are held in several institutions including the Smithsonian in Washington D.C., the University of Pittsburgh and the Philadelphia Museum of Art (Alfred Stieglitz Centre). [ABOVE] Port Stanley in the Falkland Islands. 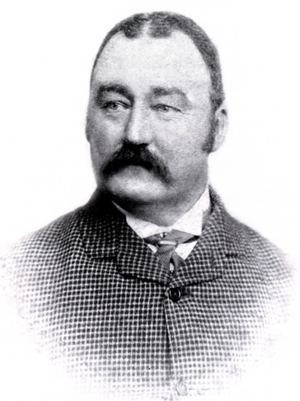 Gustav Schulz stayed in Port Stanley between 1887 and 1888. During the year he was based on the Falklands, Schulz made a photographic record of the islands. Schulz's photographic views of the Falkland Islands were later published in book form in the early 1890s. 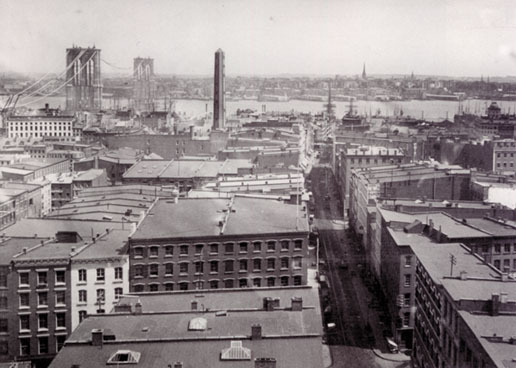 [ABOVE] New York City, photographed in the second half of the 19th century. In the early 1890s, Gustav Schulz visited New York to photograph the perfume factory run by the Fritzsche Brothers. During his stay in New York City, Schulz photographed a perfume store in Barclay Street, NYC. In 1893,a number of the New York photographs were published as photogravures to illustrate an account of the perfume industry in Europe and the United States. In 1887, Gustav Schulz made the long journey by steamship to the Falkland Islands. Schulz remained on the Falkland Islands for a year, using local boats to travel from one place to another. During his stay in the Falkland Islands, Schulz photographed the landscape and took views of Port Stanley and other settlements. [Gustav Schulz later published a collection of twenty of these photographic views in the form of photogravure prints - see the panel above]. Although the majority of the photographs taken by Schulz were topographical views, he took the opportunity to make photographic portraits of some of the leading Falkland Islanders, including Frederick Edward Cobb, the Manager of the Falkland Islands Company. 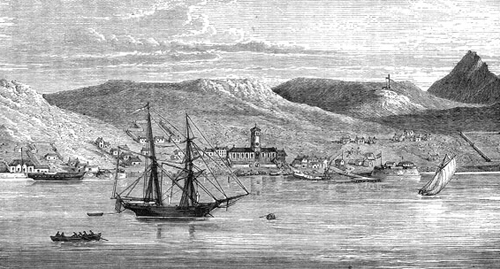 [ABOVE] Port Stanley, the capital of the Falkland Islands, depicted in an 1872 engraving. [ABOVE] A portrait of Frederick Edward Cobb (1845-1934), Manager of the Falkland Islands Company, photographed in the Falkland Islands by Gustav Schulz during his visit to the Islands between 1887 and 1888. One of the most influential figures in the Falkland Islands, Cobb helped establish a regular steam shipping service between Europe and Port Stanley. [ABOVE] The house at 12 Upper Lewes Road, Brighton, where Mrs Sarah Schulz lived with her children between 1888 and 1902. Periodically, between his various photography assignments abroad, Gustav Schulz returned to his wife and family in Brighton. 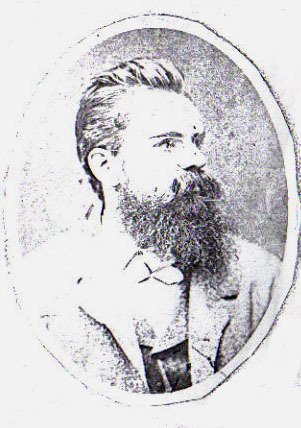 Gustav Schulz's name rarely makes an appearance in the street directories of Brighton published between 1888 and 1900. 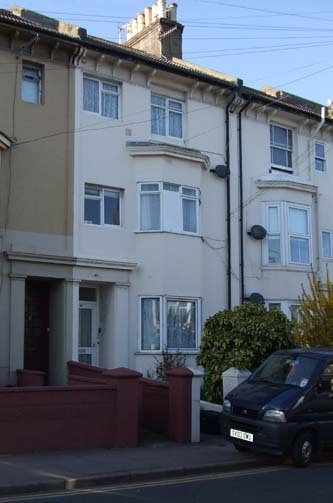 During most of this period, it is Mrs Sarah Schulz, Gustav's wife, who is shown as the householder of the family home at 12 Upper Lewes Road, Brighton. The name of Gustav Schulz appears only twice at 12 Upper Lewes Road in the Brighton street directories published over this 14 year period - once in Kelly's 1895 Directory of Sussex and again in the 1899 edition. Sometime after 1899, Gustav Schulz left his wife and children in Brighton and travelled alone to the United States, eventually settling in La Jolla, California. [ See "Gustav Schulz in Southern California", below ]. In 1897, at Brighton, Gustav Joseph Schulz (Sarah and Gustav Schulz's eldest son) married Edith Mary Jackson (born 1872, Worthing), the daughter of Avice & Thomas Lewis Jackson. By 1903, Mrs Sarah Schulz and her younger children had left Brighton.Schulz's two eldest sons, Gustav Joseph Schulz and Fritz Alexander Schulz, were already living in Hammersmith in West London at the time of the 1901 census and it seems likely that the rest of the family had moved to the London area by 1903. Mrs Sarah Schulz's second son Fritz Alexander Schulz (born 1879, Brighton) married in the Hampstead district of London during the First Quarter of 1905. The marriage of Gustav Schulz's youngest daughter Maude Louisa Elise Schulz to William Major was recorded in the Elham district of Kent during the First Quarter of 1906. When the 1911 census was taken, Mrs Sarah Schulz was recorded in Kensington, London. Two of her sons, Gustav Joseph Schulz and Carl Bruno Schulz were living and working in Croydon, Surrey. Mrs Schulz's youngest son Ernest Schulz was living in East Grinstead, the home of his married sister Mrs Maude Major. Twenty-six year old Emily Schulz was recorded in Fulham, London, where Fritz Schulz had settled with his wife. After experiencing the eastern seaboard of the United States, Gustav Schulz was keen to explore California on the western coast of North America. Schulz returned to his wife and family in Brighton for a brief period between 1895 and 1899, but as a new century dawned, Schulz left England for good and set sail for America once more. Some time around 1901, Gustav Schulz reached the Southern Californian town of La Jolla, a seaside resort situated 12 miles north of San Diego. The town of La Jolla had been founded by Frank Terrill Botsford in 1887 and by 1900 it had a population of 350. Bounded by a magnificent coastline of rugged beauty and blessed with sunshine throughout the year, La Jolla attracted a number of painters and photographers in its early history and by 1900 the seaside town had its own artists' colony. Looking for a suitable site for a studio, Gustav Schulz took possession of a wooden building on the coastal bluffs overlooking the famous 'Seven Sea Caves of La Jolla'. The sea caves were accessible only by boat, but as Schulz's premises was located above the largest and most interesting cave, he decided to turn his advantageous position into a money-making venture. In 1902, Schulz hired labourers to dig a tunnel from his studio-store, down eighty feet to the cave at sea level. After nearly two years of digging with picks and shovels, the man-made tunnel was completed in the Spring of 1903. Visitors to La Jolla could now access the biggest sea cave (later nicknamed "Sunny Jim") via Schulz's artificial tunnel. Tourists who wished to visit the "Sunny Jim" cave by land were required to pay an admission charge to Schulz. Early visitors to Schulz's Cave Store had to lower themselves down into the long tunnel with the aid of a rope, but some years later, 145 wooden steps were built into the subterranean passage. 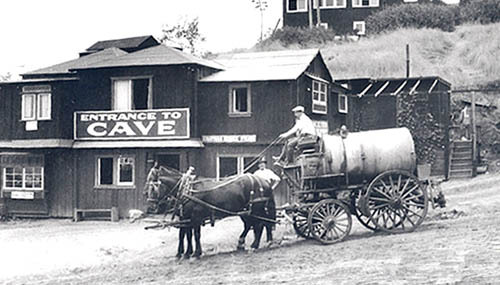 The La Jolla Cave store and Tunnel was a commercial success and it is still a tourist attraction today. "Old timers remember, too, Professor Gustav Schulz, artist, photographer, civil engineer and a lot of other things - a hearty, genial soul, and the man who dug the first tunnel into the Caves. Early visitors slid down into the depths on a rope. Prof. Schulz, a native of Germany had a tiny studio cabin over the Caves, and in the fall of 1902 he began to dig a tunnel into the Caves. On Nov 1st. he had two men working there. It was cut through on April 9th 1903, and on July 13th the (San Diego) Union (newspaper) mentions visitors. By Sept 10th Prof. Schulz's tunnel is a success and is paying well. Prof. Schulz was popular with the La Jolla ladies so there was great consternation after his death on Dec. 19th 1912, when it was discovered he had a wife and seven children across the ocean." Ellen Mills, "People and Places of Historical Significance in Early La Jolla, California"
"La Jolla Park is the finest seaside resort on the American Continent having all that heart can wish to amuse one's self ". THE SAN DIEGO UNION, 26th April, 1887. 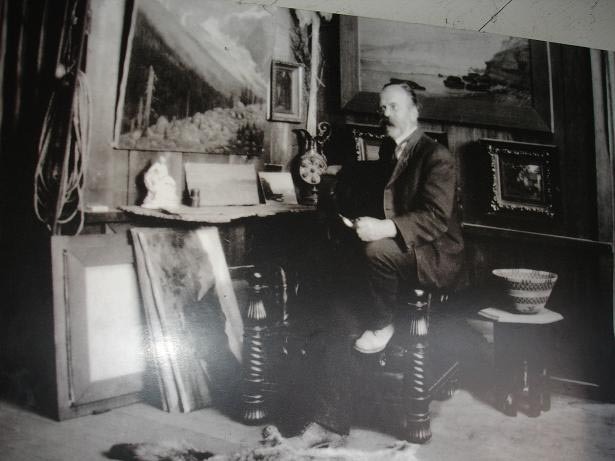 [RIGHT] Gustav Schulz photographed in his La Jolla studio around 1908. By the early 1900s, La Jolla had become an artists' colony. Schulz, who described himself as an "Artist" in census returns, had previously worked as a portrait painter. The works that surround the artist in this photograph suggests that he took up landscape painting in California. [ABOVE] Gustav Schulz's store and studio in La Jolla, California, photographed around 1908. This wooden building served as Gustav Schulz's artist's studio and photographic gallery. The sign for Eastman Kodak indicates that Schulz also sold photographic materials and served as an agent for the Kodak photo company. In 1902, Gustav Schulz arranged for a tunnel to be dug from his store, down to the large cavern below. Holidaymakers and tourists visited Schulz's store to gain entrance to the Sunny Jim Cave. 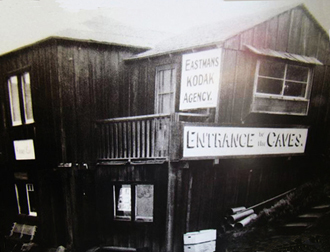 A large sign proclaiming "ENTRANCE TO THE CAVES" is attached to the side of Gustav Schulz's store. [ABOVE] Gustav Schulz photographed in his La Jolla studio around 1908. "See Paris and die ! Make your home at La Jolla and Live, Say I". THE SAN DIEGO UNION, 5th May, 1887. The artist-photographer Gustav Schulz arrived at the seaside town of La Jolla in Southern California around 1901. Schulz was then a married man and had left a wife and large family back in England. 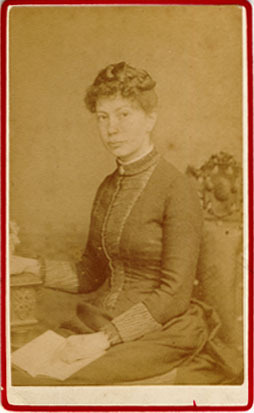 While Schulz was making a new life for himself in sunny California, his forty-three year old wife, Mrs Sarah Schulz, was residing at 12 Upper Lewes Road, Brighton, with five of her seven children; the youngest aged 10. Schulz had operated a photographic portrait studio in the English seaside town for over six years, but he was continually pulled away from his domestic life in Brighton by his overwhelming wanderlust. Brighton itself was a popular seaside resort, but clearly, as far as Schulz the artist and businessman was concerned, it could not compete against La Jolla, with its beautiful and majestic coastline, warm and sunny climate and opportunities for making money. When he died in La Jolla on 19th December 1912, in his early sixties, Gustav Schulz was the proprietor of a successful tourist attraction (The La Jolla Cave Store and Tunnel to the "Sunny Jim" Cave) and the owner of a considerable amount of property. [ABOVE] A map of Southern California showing the location of the town of La Jolla, twelve miles north of the city of San Diego. 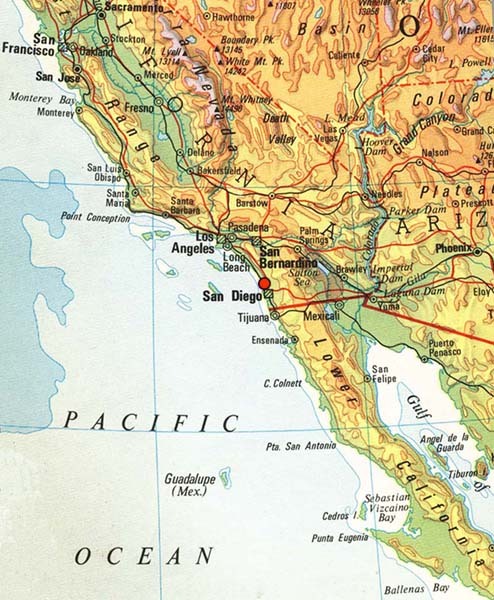 ( The position of La Jolla is indicated on the map with a red dot ). Gustav Schulz arrived in La Jolla around 1901 and spent the last ten years of his life in this seaside town. 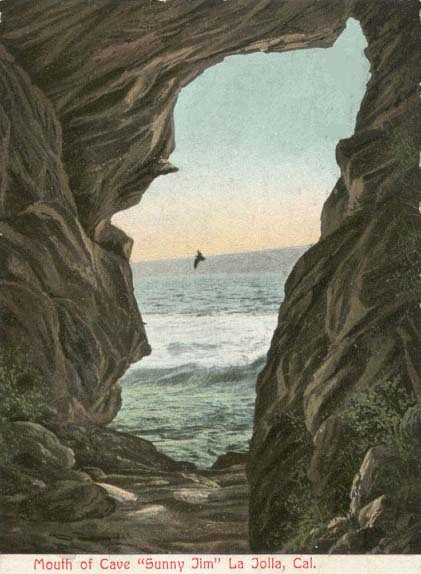 La Jolla's "Sunny Jim Cave"
[ABOVE] The Mouth of the "Sunny Jim" Cave, La Jolla, California, as illustrated on a picture postcard sent in 1907. The postmark date of 1907 indicates that this large cave, which could be reached via Gustav Schulz's tunnel, was already known as "Sunny Jim" in the early 1900s and was a popular tourist attraction some years before Schulz's death in 1912. Given that Gustav Schulz was an artist, as well as a photographer, it is possible that Gustav Schulz created the original design for this early picture postcard. The traditional story is that the writer Lyman Frank Baum, the creator of "The Wizard of Oz" ,was the first person to give Gustav Schulz's cave the name of "Sunny Jim". L. Frank Baum was regular visitor to La Jolla during the first decade of the twentieth century. There is evidence that L. Frank Baum first viewed the the cave mouth in 1904 or 1905 via Gustav Schulz's man-made tunnel. 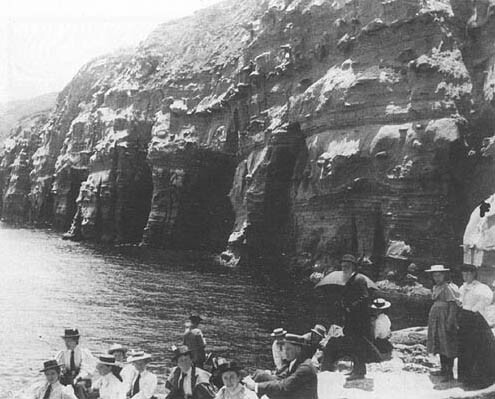 Baum later featured the La Jolla cave in some of his children's stories and Frank Baum junior confirms in an account of his father's life - "To Please a Child; A Biography of L. Frank Baum" - that the author "had in mind the caves along the shore of La Jolla, just north of San Diego, where, at high tide, visitors enter by long stairways from the ground above". 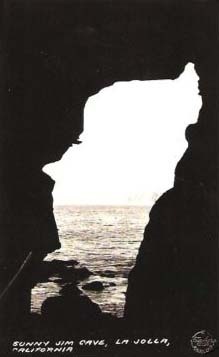 [ABOVE] A photograph of the "Sunny Jim" Cave, La Jolla, California, from a picture postcard produced in the 1940s. Apparently, the cave got its unusual name because the shape of the cave's mouth resembled the profile of "Sunny Jim", a cartoon character used to advertise a breakfast cereal in the early 1900s. [See the picture below]. 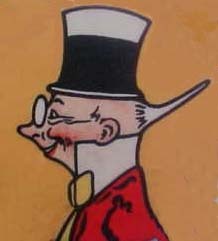 [ABOVE] A drawing of "Sunny Jim", a cartoon character created by the artist Dorothy Ficken in 1902 as part of an advertising campaign for "FORCE", the first commercially successful wheat flake cereal. From 1903, the "Sunny Jim" cartoon character appeared on "FORCE" breakfast cereal boxes and on advertising boards across the United States. Thanks to David Tatham and Christopher Sparrow for providing information on Gustav Schulz's photographic tour of the Falkland Islands. David Tatham , a former Governor of the Falklands, is the author of a biographical dictionary of the Falkland Islands. Thanks also to Cornelia Ludecke for additional information on Gustav Schulz's photographic activities. A special thank you to Pat Garner, a great grand-daughter of Gustav Schulz, for providing additional information relating to the history the Schulz family and for alerting me to Gustav Schulz's activities in La Jolla in the final chapter of his life. Pat Garner is a grand-daughter of Gustav Joseph Schulz (born 1875, Brighton), the eldest child of Sarah and Gustav Schulz. PRIMARY SOURCES : Census returns : 1881, 1891, 1901 [Brighton / Hove] ; Brighton and Sussex Trade Directories : 1876, 1877, 1878, 1879, 1880, 1881, 1883, 1884, 1885, 1886, 1888, 1890, 1891, 1893, 1894, 1895, (Page); 1874, 1878, 1882, 1890, 1894, 1895, 1899, 1903, 1905, (Kelly) ; 1875, 1876 (Stevens); 1887, 1888, 1889, 1892, 1896, 1897, 1898, 1899, 1900, 1901, 1903, (Pike) ; 1888 (Walser); 1895 (Barnes); 1896, 1898, 1899, 1900, 1902, 1903, (Towner). Photographs & Picture Postcards : Carte-de-visite portraits by Gustav Schulz of the Anglo German Studio, 44 Ship Street, Brighton and 14 Preston Street, Brighton ; Picture Postcards of Sunny Jim Cave, La Jolla. PUBLICATIONS ILLUSTRATED WITH GUSTAV SCHULZ'S PHOTOGRAPHS : "The Falkland Islands" (1890) ; South America; No.1: Falkland Islands" (G. Gross & Co. c1892) "The Factories of Schimmel & Co., Leipzig-Prag and Fritzsche Brothers, New-York-Garfield" (Grober, Leipzig 1893) ; " Nord-deutcher-Lloyd Erinnerungsblatter No. 3." (North German - Lloyd Shipping Company, Portfolio No.3) c1894.